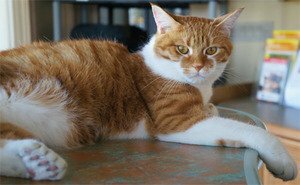 More than a year ago, in April 2012, CatTime reported on an animal shelter in Milwaukee, Wis., that was kept open thanks to a cat with 26 toes (cats typically have 18 toes). Amy Rowell found Daniel at animal control when the feline touched her head with his seven-toed paw. The Milwaukee Animal Rescue Center encouraged people to send donations of $26 – for each of the cat’s toes. Although the ploy kept the shelter afloat for a while, they weren’t enough to keep the facility’s doors open for the long term. According to the Associated Press, the Center’s owner, Amy Rowell, adopted the polydactyl feline, Daniel, and has found another job. They will remain active in the animal welfare community, however. Rowell hopes the remaining animals at the Center will be adopted by the end of the month, and as an incentive, has reduced the adoption fee to $50.